This image depicts a day in the life of a Parisian evening at the famous dance hall in 1876. 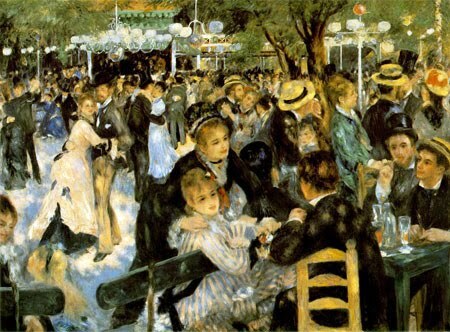 Couples dancing, groups talking and drinks flowing, Ball at the Moulin de la Galette portrays one of Renoir’s most favorite subjects. The bodies and faces of the subjects are muddled but this was part of Renoir’s technique, not a flaw. As an impressionist painter, he worked closely with Claude Monet and their influence upon each other is obvious. Renoir was interested in the patterns and shapes light makes as it catches his subjects dancing about and socializing. Splotches of diluted color or extra saturated color make patterns on the faces and elegant outfits. The splotchy technique that Renoir loved to experiment with creates this mood of intimacy where the viewer simply sees figures instead of individual characters. It is just as a viewer from a block away would see this image in the present time of 1876. The faces and individual people are less important than the impact of the entire group of young, fun Parisians. In Renoir’s use of his “rainbow palette” the painting still has dimension and life which, otherwise, would have had a good possibility of being obsolete because there is no interesting or clear central figure. Shades of pink-reds, dusty blues and charcoal create an image full of life. In Renoir’s great artistic ability, he could turn an unclear depiction of social life into a piece full of buzz and conviction. His friends, being some of the subjects in the painting, act as Renoir’s more decipherable figures in the painting. Also in focus are the city light poles. Just as the light defines the technique and mood of the painting, so do his friends. A social scene rooting at the core of the painting, Renoir’s friends are also part of this root.